A partnership between Stoke-on-Trent College and Parogon Group is assisting the company’s ongoing expansion plans, with three new trainee chefs being the first to get on the career ladder following the successful launch of a work experience scheme. Parogon currently employs around 350 people at popular Staffordshire venues The Wayfarer in Stone, The Orange Tree in Trent Vale, The Swan with Two Necks at Blackbrook, The Seven Stars at Brocton and The Block House in Baldwins Gate, as well as The Boar’s Head in Walgherton, near Nantwich. Last year, the group announced expansion plans to grow from 350 to 500 staff in 2019 and increase in size by 35%, with the launch of more restaurants in Shropshire and Balterley. As part of this growth strategy, Parogon has partnered with Stoke-on-Trent College to offer a 12-week work experience programme in order to attract and train the best young talent to become part of their kitchen teams. The first successful phase has led to three of the college’s level 2 food preparation students securing part-time jobs as trainee chefs with Parogon, which they will carry out alongside their studies. Jack Wall, 17, from Blythe Bridge, has started a new part-time job as a Commis Chef at Parogon’s Stone venue, The Wayfarer. 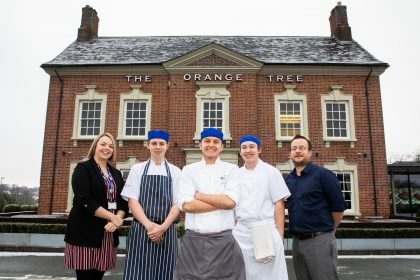 Wiktor Pocalun, 18, from Bentilee, and Kyle Johnson-Cooper, 17, from Madeley have both been offered part-time Commis Chef roles at The Orange Tree in Trent Vale. Katy Chesters, Business Development Associate at Stoke-on-Trent College, comments: “Parogon Group is one of the fastest growing employers in the hospitality sector in Staffordshire, with an outstanding reputation for high quality food and service. Ben Allison, Operations Support Manager at Parogon Group said: “Our teams put a lot of hard work and dedication into making our business a success and we are able to maintain this by recruiting the right individuals. Jack says: “My confidence in cooking has grown and I’d recommend this work experience programme to other students. I have enjoyed working in such a busy and fast paced restaurant.